YOU?LL FALL IN LOVE WITH THE NATURE OF IT! 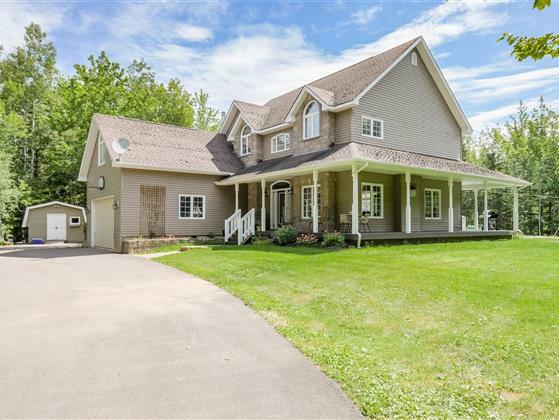 THIS STUNNING CLIMATE CONTROLLED HOME HAS IT ALL?LOCATED IN RURAL ESTATES ON A BEAUTIFUL 2.15 ACRE LOT WITH A GORGEOUS PRIVATE BACKYARD SURROUNDED BY MATURE TREE?S, WRAP AROUND FRONT VERANDA, INGROUND SALT WATER POOL, CIRCULAR DRIVEWAY AND ONLY MINUTES FROM ALL AMENITIES. ENJOY THE TAX SAVINGS OF BEING JUST OUTSIDE THE CITY LIMITS! LOCATED WITHIN CLOSE PROXIMITY TO ALL AMENITIES, HIGHWAYS AND BOTH FRENCH AND ENGLISH.